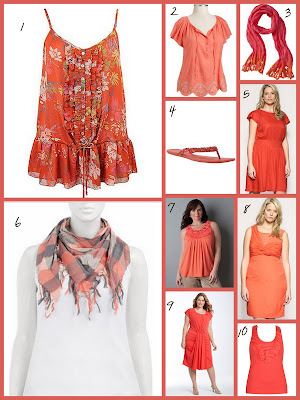 What's the difference between coral and orange you say? Coral has a touch of pink or red hue. Let's not worry about that...let's just enjoy this vibrant color in our spring wardrobes. There's nothing like a splash of color to wake up the fashion senses. I've had my eye on #3 for about two weeks now. I think I'm going to go and grab it before it's gone. And don't get me started on #5!! Love love love coral. My golden rule: Don't let bright colors frighten you! Even if it's a pair of shoes or a rockin' handbag, wear it proud! CLICK HERE TO SEE MORE FROM CURVES AND CHAOS!